Swindon Made Health Drink Is A Hit! Swindon based company My Living Water UK is celebrating a hugely successful launch of its new health laden kefir POP drink. Launched just 3 weeks ago, the drink sold out within 3 days of its debut at local organic supplier Purton Farm Shop. Farm shop manager Kate Robinson says “kefir POP is going down a storm with our customers. We thought it might be initial enthusiasm but we’ve had to order 4 more times just in the last 2 weeks! Miki Cameron who created kefir POP along with husband Nik said “We were delighted when we sold out in such a short time. We could not predict how it would be received – this is not your average soft drink after all! 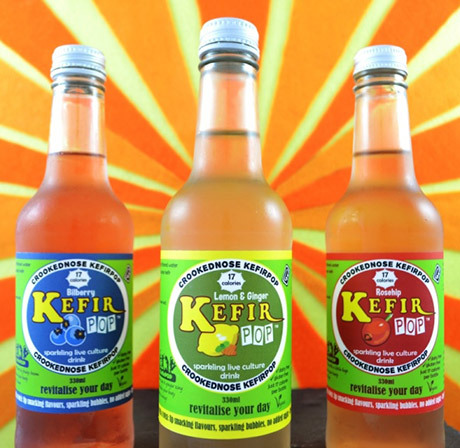 Kefir POP is currently available in 3 fruity flavours: lemon & ginger, bilberry and rosehip. Each 330ml bottle is just an amazing 17calories and is loaded with probiotics, vitamins and minerals. Kefir POP is currently available at Purton Farm Shop Purton, Pulse Wholefoods on Curtis Street Swindon and 7a Coffee Shop Fairford.